Carine is a Beninese artist based in Montreal Her interest in music begins at an early age through his parents and especially his mother. Her dedication to music takes a decisive turn in France, where she collaborated with several emerging artists from the local scene. Upon arriving in Quebec, Carine collaborated with several artists including Ranee Lee and Lorraine Klassen. Her music oscillates between the power of gospel, the sweetness of jazz, the warm African atmosphere and the authenticity of hip hop. 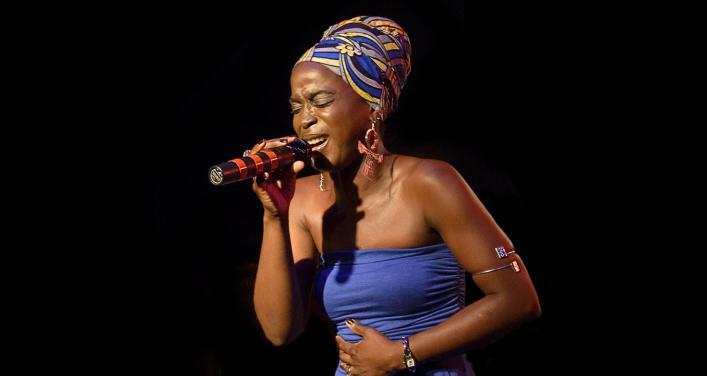 Some even compare her with the great Angelica Kidjo, nothing less! In 2018, Carine au micro released her new project O La Si. An EP with five personal and sunny songs about love, the EP title meaning “You will grow up”. A motto to remember for every painful events that made her.